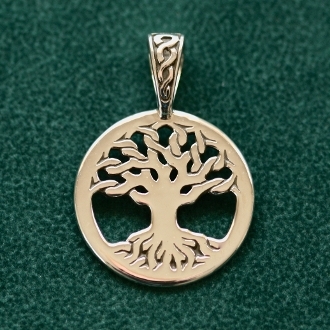 This is my newest, largest, and boldest version of my now classic Tree of Life Medallion. This version is great for Men or Women who appreciate stong presentation work, with substance, style and symbolic expression. At 30.5mm, this diameter is similar to the size of a 50 Cent piece. The celtic knot work bail will accomodate heavier chain types, and adds further celtic connection to the design concept. The ancient Celts honored nature as the ultimate teacher. Living plants and animals were revered for their ability to convey wisdom through behavior in the natural world. Trees were very crucial to the Celts for practical and spiritual valve, with the branches reaching high into the heavens - touching the divine, spiritual, and invisible forces of nature. The roots reaching deep into the physical earthly plane, grounding deep within tangible reality. These distinctly separate forces cannot support life on their own, but when these energies combine, life blossoms from this union. The natural cycles of "Life, Death and Rebirth" are also exhibited through seasonal rotation, exemplifying further the connection that Trees and plant life portray as Life's great teacher and healer. Many other traditions have some form of connection to the living tree concept, including Native American belief, the Bodhi Tree in India, and several other great middle Eastern traditions. People really do enjoy the connectivity that they enjoy with others when they wear the "Tree of Life" talisman, and it is a great honor, as an artisan, to be a part of this connection with others beyond the boundaries of my work as a jeweler, as we touch base with each other in the realm of universal truths through reminders of our place on Earth. Copyright © 1997-2017. All rights reserved.